The yellowheaded spruce sawfly,Pikonema alaskensis (Rohwer), was known to possess a potent secondary pheromone with the polarity of an alcohol, based on earlier studies with Florisil fractions. Purification of the 25% ether-hexane Florisil fraction (polarity as with alcohols) and the hydrolyzed 5% ether-hexane fraction (polarity as with esters) from 50,000 females yielded a total of ca 3μg of an active compound identified as (Z)-5-tetradecen-1-ol (Z5–14∶ OH). 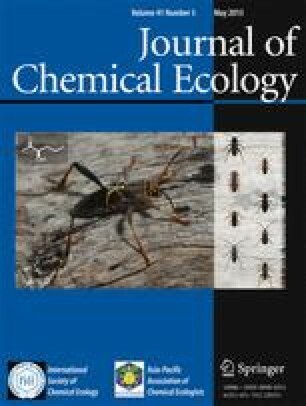 When added to 100 ng of (Z)-10-nonadecenal (Z10–19∶Al), which behaves as the primary pheromone in this sawfly, 0.5 ng of syntheticZ5–14∶ OH caused an 8.8-fold increase in the greenhouse bioassay response, compared toZ10–19∶Al alone.E5–14∶ OH caused a 2.8-fold increase. Only the combination ofZ5–14∶ OH andZ10–19∶ Al consistently elicited mating attempts among males. When Hercon® formulations ofZ5–14∶OH andZ10–19∶ Al were used together to bait traps, catches were up to four times higher than for theZ10–19∶ Al alone, but this increase was seen only after emergence and mating activity in the field population were virtually complete. TheZ5–14∶ OH was inactive alone, and at higher levels it depressed trap catches toZ10–19∶ Al. The Hercon formulations ofZ5–14∶ 0H andZ10–19∶Al together were as attractive as virgin females.Z10–19∶Al alone and the (Z,Z)-9,19 hydrocarbon dienes (found in all females and able to oxidize in air to produceZ10–19∶Al) were similar to mated females. ThusZ5–14∶:OH accounted for the difference in attractiveness between virgin and mated females. Paper No. 13,073, Scientific Journal Series, Minnesota Agricultural Experiment Station, University of Minnesota, St. Paul, Minnesota 55108.